Another Shuttle Run??!! This time Musing Mark and Fey transport the Homecoming King and Queen of Pride 48: Eric & Brenda Boo! (I laughed so hard while I was editing this that tears were streaming down my face.) Explicit Tag courtesy of Brenda Boo. PWN-159 P48 2012 Shuttle Run 3 – Melinda and That Peter G! Another Shuttle Run from Pride 48 Las Vegas. This episode our guests are Melinda (from Somes Bar) and That Peter G! Find That Peter G at: http://lotsl.podbean.com (also available in iTunes). In search of a cheap breakfast with Jay the Hauntcub and his partner Ron. We take a Shuttle run to collect ZombieGurlTJ (TJ from Nowhere) and Dr Wes Pythagoras Stone. Also a car question about manufacturer’s list price. The first of many Shuttle runs starring the Amazing Daniel Brewer and Unflappable Adam Burns from Dubious Intent Plus! En route from Lake Tahoe to Las Vegas for Pride 48. A short discussion on cheap hotel room showers. Loving the beautiful Californian windy roads. Fixed a flat tire for about $3.00. Should be an old man or a party boi? A little meta discussion about the Pride 48 Shuttle. Driving thru the long lonely desert. The Laffing Buddha has predestinately bestowed upon us the theme song for the “Happiness Setting” question of the month. P48 Travelogue 1 – Sneaking Away to the Carwash. A short update on the progress of the Pride48 Shuttle as it makes its way down to Las Vegas. Mr Anderson and MaxTheDog join me and make big messes in the Shuttle. Fuel price competition. Then it just gets a bit rambly. 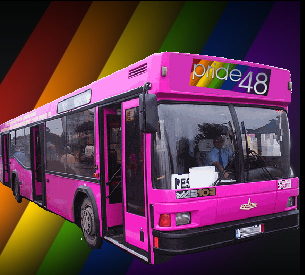 Follow @Pride48Shuttle on Twitter and send a Direct Message, or send an e-mail to Pride48Shuttle@PinkWheelnuts.com with your ride request. The shuttle will be in operation from Sept 13 at 0600 hrs to Sept 16 at 1800 hrs.